The young, green, fresh coconuts for drinking are harvested a few months earlier than the more commonly known brown and "hairy" coconuts. 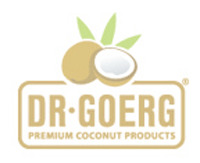 The young coconut water inside is a clear and slightly sweet liquid surrounded by a soft, thin layer of coconut flesh. In this stage of growth, the nutritional value of the coconut water is very high making it very valuable for the body. It is also isotonic, which means that the ratio of nutrients to liquid is similar to that of human blood resulting in excellent bioavailability. Last but not least, young coconut water is a low-fat and low-sugar alternative to sugary soft drinks and high-calorie beverages. How do you get to the water in the young coconut? A green coconut contains between 250 and 350 ml of coconut water. Because the shell is not yet hard at this point, it can easily be punctured using a coconut opener. Then the coconut water can be drunk with a straw. In order to obtain all the liquid from the fruit, two holes should be made in the shell with the coconut opener. While the coconut water flows through one hole, the other prevents the formation of a vacuum. Our young, green and harvest-fresh coconuts for drinking come from Thailand>. There they ripen under the most natural conditions on mother trees in mixed cultivation without the use of pesticides. After harvest, the coconuts are washed and have their skin and fibers partly removed. Finally, they are packed in plastic one by one and thoroughly chilled before being shipped to Germany. Instead of cooking rice in plain water, use coconut water and enjoy the deliciously different taste. Or use coconut water instead of milk when enjoying breakfast muesli with fruit and oats. Iced coconut water is a luscious and low-calorie thirst quencher. Replace your sugary drinks with this naturally sweet one and save loads of empty calories. Coconut water is a naturally isotonic beverage that can provide important nutrients that your body can absorb and process quickly both before and after a workout. Our young, green coconuts are sent to customers in separate shipments of packages of 9 as soon as they arrive in Germany. Stored in a dry place at a temperature of 4° to 12°C, the green coconuts have a shelf life of up to 28 days. When stored at room temperature, they should be consumed within 5 days. After opening, consume the fruit straight away. The coconut water and the coconut flesh remain fresh for 3 days when stored in the refrigerator. As this is a natural product, variations in color, size and shelf life are to be expected. Die besten Kokosnüsse die ich je probiert habe, groß und frisch! Einfach lecker! Unbedingt probieren. Der Favorit meiner Frau morgens nach dem Aufwachen, das frische Kokoswasser direkt aus der Nuss. \nImmer wieder gerne. Die Bio-Trinkokosnüsse sind in einer\nsehr guten Qualität, super frisch\nund schmeckt wunderbar. Ich liebe diese Kokosnüsse aber an der genauen Lieferung sollte noch gearbeitet werden. Wunschtermin!